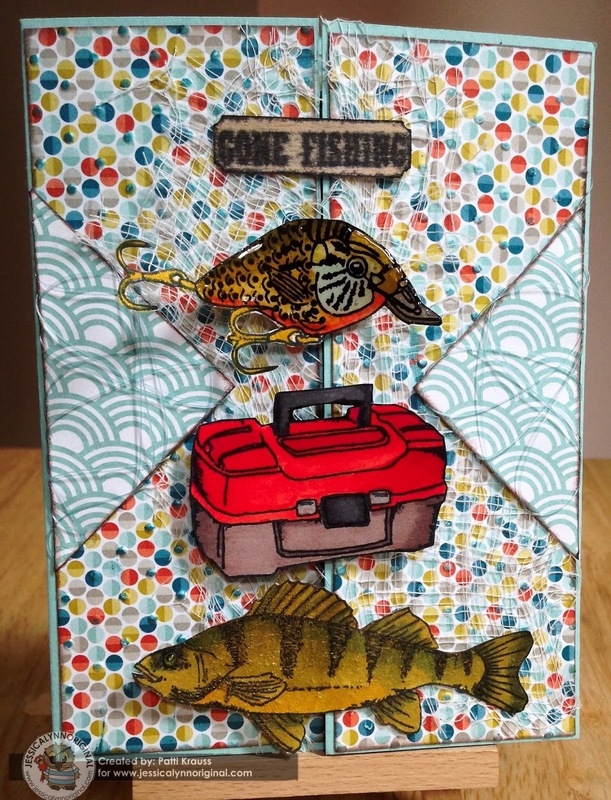 Hi Friends: It's time for my third project using the new Fishing At Phantom Lake Wisconsin Happy Father's Day Fish stamp set from JessicaLynnOriginal stamps. This set is available for pre-order until April 22nd at a discount of $2.65 off the regular price. Today's project uses a few other stamps in the set - I just love the tackle box and the fishing lure, so I had to use them on this gate-fold card. It's hard to see in the photo, but I used some cheesecloth to look like fish net and some actual fishing line to add texture to the panels. There's also some Crazing medium on the fish to mimic scales, and a bit of glossy accents on the lure. This card was great fun to make, since I got to incorporate a bit of mixed media textures. We would love to see what you do with this set, if you want to post them up on Jessica's Facebook page. Visit all of my design teammates and see what else they've done with this great masculine stamp set. Don't forget, if you decide to purchase any stamps or digis from the store, please remember to put my name in the instructions/comments section during checkout. See below for instructions and supplies for this card. Thanks for visiting - hope you have a great crafty day! Stamp images onto smooth white cardstock using black ink, color with Spectrum Noir markers and fussy cut them. Add silver Glitter Brush Pen to buckles on tackle box, gold and clear Glitter Brush pens to lure hooks and bill. Cover lure with Glossy Accents to make it look plastic. Add Crazing Medium to fish and allow to crack; enhance the cracks with Gold Inka Gold, then add Glossy Accents to eye. 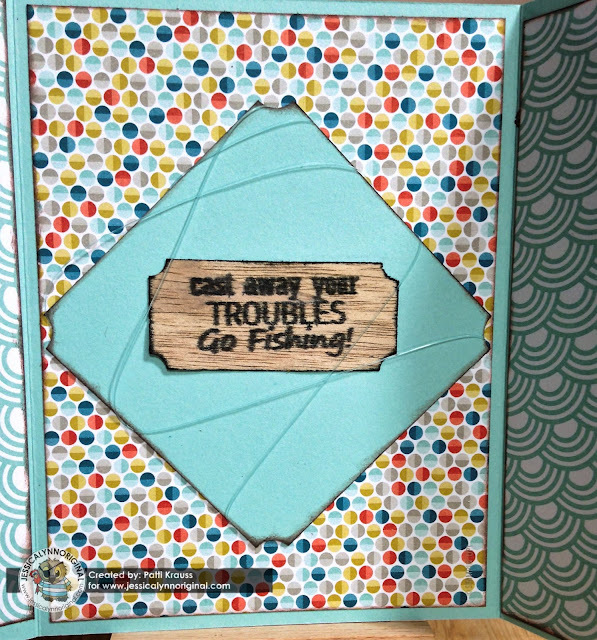 Stamp "Gone Fishing" sentiment onto wood paper with black ink, cut with label punch and ink edges. Create A2 sized gatefold card from cardstock. Cut patterned paper to fit the front panels and emboss with dots folder. 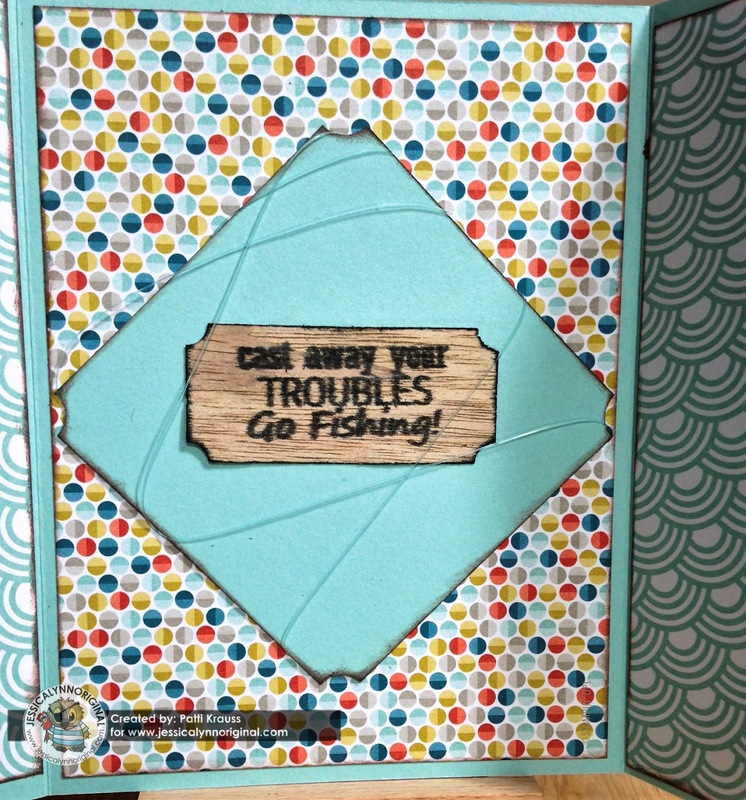 Enhance the dots with turquoise wax, ink edges, and glue to card front. Glue cheesecloth to both front panels. Cut triangles of patterned papers and wrap fishing line around them, then glue to card. Use foam squares to attach the images to the left side of the gatefold. Use the same patterned papers to decorate the inside. Cut a panel of cardstock, use ticket corner punch on the corners, ink edges, then wrap with fishing line and adhere to center panel. Stamp "Troubles" sentiment onto wood paper and cut with largest label punch, then adhere to center of inside panel. LOVE this! I didn't notice the netting before... so happy I came to take a closer look! Love all of the details!